Not sure if I am being asked to repost here or not but Roon Radio continues to repeat tracks. I love that it now plays music not in my library but would really love to see the repetition problem solved. Thanks. I have moved both of your posts to the Roon Radio Feedback thread and you can discuss the issue here. I’m not sure if anyone else is seeing this behavior but can you specify what are you using as the seed (track/artist starting off)? Is this reproducible every time? Norris, I think the seed track constantly changes. I suppose the problem is reproducible in the sense that I, eventually, always find that there are songs that are repeating. Why it is so often these same peculiar tracks, I don’t know. Is my Roon just haunted? Thanks for that, and it looks like it would do the job, but I don’t see a ROCK option. Or is there? No, you can’t install Extensions on ROCK. You need to install them elsewhere. I’ve actually installed the Extension Manager on a RPi running DietPi, and used that to install the Alarm Clock extension. I have no idea where to post this on your BBS, but I’ve been testing the new improved Roon Radio since the release of 1.6… today, it’s been on for the past seven hours. I know I probably going to get bashed about this, but I do not really like the way Roon Radio AI selects from Tidal. I have found that in may case it selects newer releases from similar artists. Personally, I like the history and following the lineage of bands, (ie Mose Allison’s influence on Pete Townsend and the Who). So I don’t necessarily want to listen to his latest/last albums. I had thought that using someone’s current library as a means to seed the AI would be interesting, but that was already suggested and rejected in previous post. It also appears that the Roon radio AI rarely returns to my library, going mainly from Tidal (Red Book, but that has been covered here already). A proposed improvement would be for the user to control the percentage of Tidal, Qobuz, and personal Library. This would allow the user to explore music new to them on their own terms. Using this info to train the AI would also make the AI Radio better for all. I’ve experienced all of the above with 1.6 Roon Radio. Sometimes great new stuff that is in the same audio thread as the seed, other times it goes off the rails within a few songs, and yet other times it repeats either the same track from the same album or it repeats the same track but from a different source/album (i.e. local or differing album but same track from Tidal). I suspect the algorithm is being updated, along with the input data from all using it, to nudge the blob in different directions. I’m scared once the real neural network becomes self-aware, it won’t need us anymore. Searches and artist photos have been quite hit and miss, mostly miss, this morning. I seem to notice some learning behaviour in Radio.This weekend, after downvoting six tracks in a row, the algorithm apparently went off in a different - and pleasing - direction. I had never really bothered with Roon Radio until 1.6 and generally I have found it excellent. The integration with Qobuz makes it even more desirable. However, one feature I have found particularly annoying is that it selects albums/tracks that I have already played or included in the queue and secondly, it keeps on providing as options albums/tracks that I have already downvoted. is there a way to have my Primary Version played instead of Tidal/Qobuz or my other local versions? I noticed that Radio plays a lot of tracks from the streamers in CD resolution even when I have a local version listed as “Primary” and even if my version is higher resolution. This is more valuable when I have clear preferred digital versions and take the time to list them as Primary. Is my voting exclusively for the benefit of the big Roon data cloud or can I train Roon specific to my interests? I recall that I can vote “thumbs down” and it’s relatively meaningless for my future experience since I’m just one of many voters. Another session with Roon Radio - started with Mendelssohn String Quartet No 6 played by the Doric SQ - to be immediately followed by exactly the same work played by the Ebene Q. Now even pop music listeners would not expect exactly the same song but by a different artist to come up as a selection on Roon Radio. I’ve tried reading through this whole thread, but it’s long so sorry of this has been asked before. 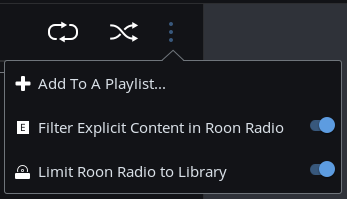 I really liked Roon Radio before it included all of Tidal, and although I will use this feature from time to time as well I want to know if there is an option to just use library songs in radio now? I want to know if there is an option to just use library songs in radio now? Seems like inconsistent UI design to me. I remember seeing the switch there and I toggled it off - I looked (almost) everywhere and the only way I could figure out how to find it again was to search for it in the forums (and came across this thread). In hindsight I guess I should have clicked the three dots menu before searching online, but it wasn’t that obvious to me. I agree that this toggle should be in the main screen (or not at all even when it’s toggled on). I think I saw above that when there are several Album Artists (or Primary Artists?) the Now Playing screen will show them all, not auto-cycling like on the CC Display but manually cyclable. Now I can’t find it. In any case, I get only one artist and can’t find any rolling button. Is it there, if so how?